WILLIAMS, John Sharp, (grandson of Christopher Harris Williams), a Representative and a Senator from Mississippi; born in Memphis, Tenn., July 30, 1854; after the death of his parents moved to Yazoo County, Miss. 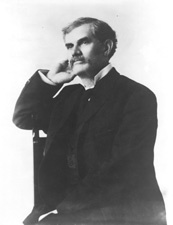 ; attended private schools, the Kentucky Military Institute near Frankfort, the University of the South, Sewanee, Tenn., the University of Virginia at Charlottesville, and the University of Heidelberg, at Baden, Germany; subsequently studied law at the University of Virginia and in Memphis, Tenn.; admitted to the bar in 1877; moved to Yazoo City, Miss., in 1878; engaged in the practice of law and also interested in cotton planting; elected as a Democrat to the Fifty-third and to the seven succeeding Congresses (March 4, 1893-March 3, 1909); was not a candidate for renomination in 1908; minority leader in the Fifty-eighth, Fifty-ninth, and Sixtieth Congresses; chairman, Committee on Party Leaders (Fifty-eighth through Sixtieth Congresses); elected as a Democrat to the United States Senate in 1910; reelected in 1916 and served from March 4, 1911, to March 3, 1923; declined to be a candidate for renomination in 1922; chairman, Committee to Audit and Control the Contingent Expenses (Sixty-third Congress), Committee on the Library (Sixty-fourth and Sixty-fifth Congresses), Committee on the University of the United States (Sixty-sixth Congress); retired from public life and lived on his plantation, 'Cedar Grove,' near Yazoo City, Miss., until his death there September 27, 1932; interment in the family cemetery on his plantation. Papers: Correspondence in Oscar Wilder Underwood papers, 1876-1962. Papers: 1902-1932 (bulk 1914-1932). 91 linear feet. Chiefly correspondence from House and Senate service with government officials concerning politics in Mississippi, national politics, military preparedness, women suffrage, League of Nations, disarmament, the Irish question, and self-determination of nations. Constituent correspondence deals with the same subjects but particularly with government employment, state politics, war risk insurance claims, government allotments, claims against the government, veterans' pensions, inquiries regarding the Veterans Bureau, and applications for appointments to the service academies. Also includes Armenia relief petitions (1919-1920), biographical material, newspaper clippings (1919-1920), and annotated printed material. Finding aid. Papers: 1894-1929. Ca. 2 feet. Transcripts, in part, of originals in the Library of Congress. Personal and family correspondence, speeches, financial records, and other papers. Finding aid. Papers: 3 letters (1904-1907); 1 letter (1912) in Randolph-Sherman papers; 17 letters (1907-1917) in Rice family papers; 1 letter (1905) in Hobbs family papers; 1 letter (1905) in Marion Henry collection; and photographs in various collections. Papers: Correspondence in Henry Wirt Newkirk papers, 1893-1931; William Butts Mershon papers, 1848-1943; and Henry Carter Adams papers, 1864-1924. Finding aid. Papers: August 23, 1917. 1 letter. To J.G.B. Bulloch, written on the stationery of the U.S. Senate Committee on the Library. Dickson, Harris. An Old-Fashioned Senator: A Story-Biography of John Sharp Williams. New York: Frederick A. Stokes Co., 1925. Osborn, George Coleman. "The Friendship of John Sharp Williams and Woodrow Wilson." Journal of Mississippi History 1 (January 1939): 3-13. ___. John Sharp Williams: Planter-Statesman of the Deep South. Gloucester, MA: Peter Smith, 1964. ___. "John Sharp Williams Becomes a United States Senator." Journal of Southern History 6 (May 1940): 222-36. Williams, John Sharp. Thomas Jefferson: His Permanent Influence on American Institutions. New York: Columbia University Press, 1913.